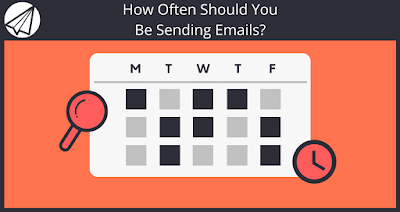 How Often Should You Be Sending Emails? 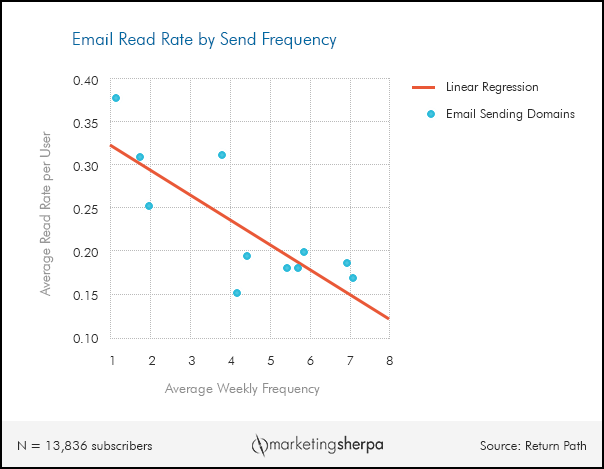 It’s one of the most common questions new email marketers have: “How often should I be sending my emails?” And for good reason: How often you mail (aka your “mailing frequency” or “send frequency”) makes a huge difference to your engagement rates, your workload, and your results. There’s one thing I gotta tell you, though. While we can cite a few studies and give you some guidelines on how often to mail, you’re probably going to have to figure this out for yourself. Every list is different. The optimal mailing frequency will be different for each list. For most email marketers, mailing more than once or twice a week makes subscribers start to tune them out. 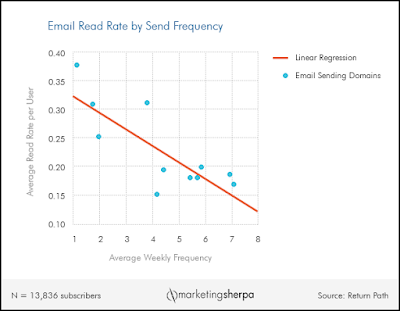 Some email marketers decide to mail more frequently even if it suppresses their engagement rates. Why? Because they need the sales. Say you’ve been emailing once a week, making about $500 per email. You kick your emailing frequency up to five times a week. This makes your earnings per email crash to $200 per mailing. But overall, you’ve doubled your weekly earnings to $1,000 a week. Sound tempting? For a lot of people, it is. But be warned: This approach can lead to “list fatigue” – a condition where your subscribers start to really tune you out. List fatigue can be hard to reverse. That’s especially true now, as many email services have started to move messages from certain senders into the spam folder if their subscribers disengage too much. On the opposite side of the spectrum, you might try to mail as little as once a month. That will make for less work on your part (and less traffic and sales), but it raises another problem. There’s a big risk your subscribers will actually forget about you in between email messages. And if they don’t recognize your name in their inbox, they’ll probably delete your email. Weekly emails: The happy medium? All those reasons are why most email marketers settle between the two extremes. Weekly emails are a frequent enough to hold subscribers’ attention, but not so frequent that they take up all your time to create. Weekly emails also jive with most company’s content production schedules. They also give you an easy way to test – all you have to figure out is which day of the week is best. The best way to determine your ideal mailing frequency is to let your subscribers choose. Let them choose how often they’ll get emails from you after they’ve signed up – in each email message. You can automatically move people to a new list in your Sendlane account if they click a link like this. There are instructions for how to do that in the video on this page (http://help.sendlane.com/knowledgebase/moving-subscribers-to-a-new-list/). You could also create a Workflow in Sendlane™ that moves someone to a new list based on which page they’ve viewed. The page they would view to trigger this Workflow would be the landing page of the hyperlink in your email. So in the example above, the page that would trigger Ryan’s Sendlane™ Workflow to move a subscriber to a “mail only once a week list” would be: http://www.ryanhealy.com/stop-daily-emails-get-updates-once-per-week/. Pretty slick, huh? Split your email list into two separate lists. Yup… you’re going to need a big enough list to get statistically valid results. To put a number on it, you’ll probably need at least 1,000 subscribers. And 2,000 or more is better. Start sending emails at frequency #1 to List A. Track your results. At the same time, send emails at frequency #2 to List B. Do this for at least two weeks. A month is better. Check your Sendlane reports to see which list performs better. Check your sales from each list, too. Clicks and opens don’t always tell the whole story . If your list is too small to split in half, you can just mail to everybody at frequency #1 for about a month, then mail at frequency #2 the month after that. Then compare results. This should give you a clear picture of which frequency is best. Remember that losing a bit of engagement is okay if your sales don’t dip at the same rate. The best way to answer this question for yourself is to give your subscribers control over how often they hear from you. The second best way is to test. But what if you can’t do either, and just want a starting point? Well, mailing once a week is pretty safe. Even every other week can work. Just try to keep it consistent. Always focus on delivering great value to your subscribers, whatever you decide to do. If you are ready for an autoresponder that allows you to test and adjust your email sending frequency to achieve your best results, sign up for your free trial of Sendlane™ today! How often are you sending emails? Are you one of the lucky ones who can mail every day and still get high engagement rates? Tell us what’s working for you below in the comments. Also, we appreciate you liking and sharing this post on all of your social media sites. If you found this post helpful, chances are your friends will also! Use the “share” buttons at the bottom of this post to help us reach more email marketers. #DIGITAL: How Often Should You Be Sending Emails?